Throughout time, people have chosen to adopt a vegetarian or vegan diet for a variety of reasons, from ethics to economy to personal and planetary well-being. Experts now suggest a new reason for doing so: maximizing flavor - which is too often masked by meat-based stocks or butter and cream. 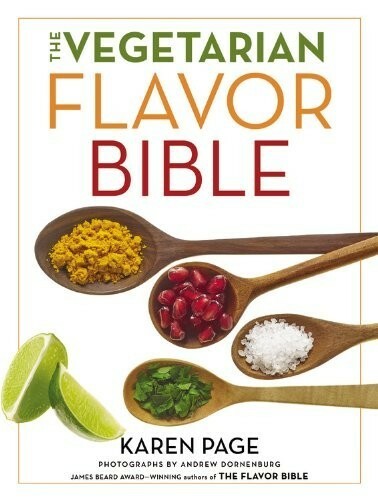 The Vegetarian Flavor Bible is an essential guide to culinary creativity, based on insights from dozens of leading American chefs, representing such acclaimed restaurants as Crossroads and M.A.K.E. in Los Angeles; Candle 79, Dirt Candy, and Kajitsu in New York City, Green Zebra in Chicago, Greens and Millennium in San Francisco, Natural Selection and Portobello in Portland, Plum Bistro in Seattle, and Vedge in Philadelphia. Emphasizing plant-based whole foods including vegetables, fruits, grains, legumes, nuts, and seeds, the book provides an A-to-Z listing of hundreds of ingredients, from açaí to zucchini blossoms, cross-referenced with the herbs, spices, and other seasonings that best enhance their flavor, resulting in thousands of recommended pairings. The Vegetarian Flavor Bible is the ideal reference for the way millions of people cook and eat today-- vegetarians, vegans, and omnivores alike. This groundbreaking book will empower both home cooks and professional chefs to create more compassionate, healthful, and flavorful cuisine.